After a full redesign just last year, the Honda Civic returns to the lineup with a number of additions, including the introduction of an all-new Honda Civic Si, the most recent exhilarating take on this reliable and well-equipped compact car. Here we’ll take a look at the eight different Honda Civic Si generations we’ve seen over the years. Learn where this compact sports car has gone and where it’s going, and take the latest iteration for a test run near Lakewood at Honda of Toms River! Having already gone through two different generational iterations, the Honda Civic expanded its repertoire in the mid 1980s with the first generation 1985 Honda Civic CRX Si and 1986 Honda Civic Si hatchback, powered by a direct injection 1.5L SOHC four-cylinder engine that was good for 91 hp. The Civic CRX Si returned for the 1988 model year with a number of upgrades, including a more extensive exhaust system, a five-speed manual transmission, sport front seats, and improved handling via a four-corner A-arm suspension and front and rear stabilizer bars. A 1.6L SOHC inline-four engine developed up to 105 hp for the first model year, and it was capable of producing 108 hp by the time the Civic Si hatchback hit the market for 1989. The third generation came exclusively in the hatchback configuration and increased power as well as sophistication. In addition to a moonroof, this model also came with additional creature comforts like cruise control and rear speakers. The 1.6L four-cylinder engine got a bump in output to 125 hp. Meanwhile, rear disc brakes gave way to an antilock brake system (ABS) for the 1994 model year, bringing superior handling when braking. 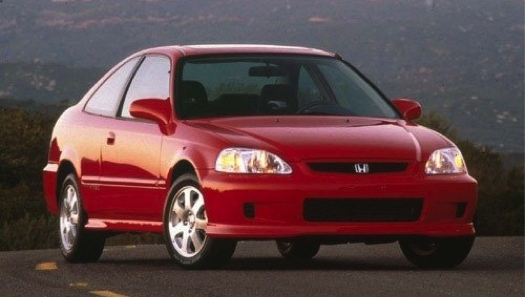 The 1999 model year marked a giant leap forward for the Civic Si in terms of performance, beginning with its sport-tuned, fully independent suspension and four wheel disc brakes. This was also the first American version of the Si to get a DOHC engine under the hood. This 1.6L inline-four powerplant was good for 160 hp. Si badging was also added to the mix, advertising the unique performance status of this model. The fourth generation was offered solely as a coupe. Developed on a completely different platform than the regular Civic of its generation, the fifth generation of the Civic Si ran from 2002 to 2005 and was offered only as a hatchback. It featured MacPherson front struts and a 2.0L DOHC four-cylinder engine that pushed out 160 hp. Available in the U.S. market starting in the 2007 model year, the sixth generation Honda Civic Si was offered as both a coupe and sedan. Fitted with a 2.0L inline-four engine that made a robust 197 hp, this Civic Si came with quick-shifting six-speed manual transmission on the other end of the powertrain and a limited-slip differential for sophisticated handling when pushed to the limit. Offered yet again as a sedan and coupe, the seventh generation Honda Civic Si debuted for the 2012 model year. It was powered by an even more commanding engine, a 2.4L DOHV i-VTEC inline-four that made 201 hp. By the 2013 model year, the Si Coupe was able to move from 0 to 60 mph in just 6.1 seconds, a strong number by any standard. The newest rendition of the Honda Civic Si is on sale now at Honda of Toms River. All-new for the 2017 model year, the current generation of the Civic Si receives its power from a turbocharged 1.5L inline-four engine with an Adaptive Damper System. It’s come a long way since its humble beginnings and is now able to generate 205 hp and 192 lb-ft of torque, making it the most powerful Civic Si to date! Even with this notable increase in power, the newest Civic Si is still able to get an EPA-estimated 38 mpg highway*. Are you interested in getting a closer look at the new Honda Civic Si to see how it feels inside the cockpit? Become a part of the Honda Civic Si tradition by visiting Honda of Toms River, located across the street from the Super Stop & Shop at 346 New Jersey Route 37 East in Toms River, NJ. Contact us directly at (844) 520-9001 to schedule a test drive! *38 mpg rating for Civic Si. Based on 2018 EPA mileage ratings. Use for comparison purposes only. Your mileage will vary depending on how you drive and maintain your vehicle, driving conditions and other factors.